Supramolecular metal-driven self-assembly is a very powerful method for the rational desing of supramolecular entities exhibiting a variety of bi- and tri-dimensional geometric organizations, with potential applications as chemical sensors and reaction nanovessels. Along this strategy, we have been able to synthesize a variety of structures that include molecular nanosized squares and rectangles, helicates and trigonal and tetragonal prismatic nanocapsules. 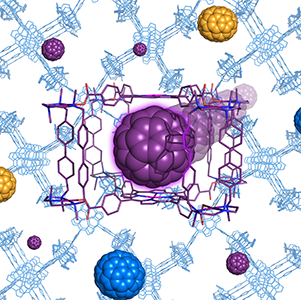 Our strategy consists in the self-assembly of hexaazamacrocyclic dimetallic (Cu or Pd) molecular clips with polycarboxylate linkers to construt capsule-like compounds with selective host-guest properties to encapsulate a variety of molecules including fullerenes. Furthermore, we are interested in the use these cages as nanoreactors.